When Boardnaut said “really soon”, I guess they meant it, because Maquis just launched on iOS today. 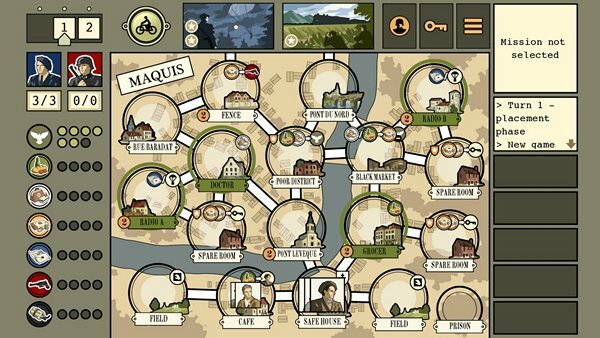 Maquis is a solitaire worker-placement game with variable goals. The player places his resistance agents on spaces around town to achieve his goals (blowing up trains, publishing underground newspapers, aiding spies etc.). At the same time collaborators and soldiers patrol the area. Agents who can’t make it back to the safe house at the end of the day are arrested, and never seen again. What’s even better news than its release, is that Boardnaut contacted us and asked if we wanted to give away a few FREE copies of the game to some of our lucky readers. So if you want a chance of winning a free copy of Maquis enter using our simple gleam form below. Note that the app is not available in China and Japan, as long as you live in a territory where the app is sold, you can enter.